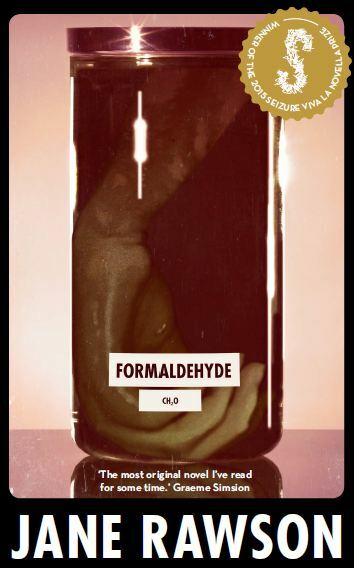 Formaldehyde is an adorable little book about arm transplants and bureaucracy, two of my favourite topics. The story is a comic, surrealist puzzle about identity. It includes jokes, cats, swear words and some slightly gross bits of anatomical detail. Also, love. It was published by Seizure in August 2015, thanks to winning their Viva la Novella prize. Or if you’re in Melbourne’s western suburbs (and why wouldn’t you be? ), stroll over to Yarraville’s Sun Bookshop and pick up a copy there. And here it is on Goodreads. The other two winners of Viva la Novella are Christy Collins for The End of Seeing and Marlee Jane Ward for Welcome to Orphancorp. Why not read all three? My second book for Xmas break. I read Jane’s first previous novel, A wrong turn at the Office of Unmade Lists Xmas 2015 and much enjoyed it. I hope she keeps producing a new book each year. Quirky – each presents as plausible and natural some elements that would not usually pass as realist writing. Both involve a little futurism. I am sucked in by the narrative drive, like the characters and want simply to know what will happen. When she works out how to wrap it all up better she will have a grand novel for us all. This one bounces between 2000 and 2022, each chapter clearly marked for time period, characters gain and lose aspects of themselves.. Hard to describe further just in case you think to find it to read.. Do.